One cannot have a complete Davao vacation without visiting Davao Crocodile Park. It's a seven-hectare land that is not only home to saltwater crocodiles but also monkeys, ostriches, snakes, birds and many other wild animals. There are many enjoyable activities to take part and food stations to look forward to visiting. 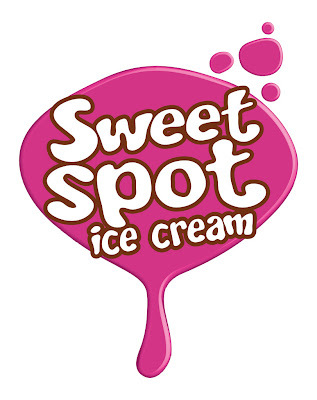 Whatever you plan to do, don't leave without trying out what Sweet Spot Icream has in store. It's a given that every tourist will flash a surprised face at the store staff when done perusing the menu. The reason for this is the names and prices of the ice creams. There are only twelve flavors offered by the store- most of them I'm sure you've never heard before. They are Banananut Bomb, Durian Dynamite, Strawberrygood Dragonfruit, Mangomazing, Chocobangbang, Crazy Cheese, Coffee Rush, Crocodile Egg Durian, Cookie Monster, Buko Pandan, Vanilla and Melon Manila. They are priced from Php40.00 - Php60.00 per cone. The best-selling and recommended flavor of the store is Crocodile Egg Durian ice cream, so I chose to have it instead of staying safe with familiar flavors. The Crocodile Egg Durian ice cream looks like your average vanilla ice cream. It's so simple you'll wonder what makes this dessert tick. Crocodile Egg Durian ice cream comprises of eighty percent crocodile egg yolk. The remaining twenty percent is a mixture of sugar, corn syrup, fresh and condensed milk and ripe Durian. This also explains why it's so pricey. 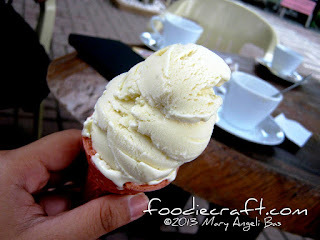 It may not be visible to the eye but there are actually Durian bits in the ice cream. And no, it does not smell bad but it does have a strong Durian aroma. I found enjoyment nibbling on the Durian bits. The crocodile egg yolk made the ice cream very much creamy in comparison with mainstream ice creams. It's delicious! If you ask me if I'll have order Crocodile Egg Durian ice cream when I get back to Davao Crocodile Park, well, definitely, I will. Crocodile Park is open everyday from 8:00am to 7:00pm. It is located at Sweet Spot Ice Cream, Davao Crocodile Park, Riverfront Corporate City, Diversion Road, Ma-a, Davao City. For inquiries, call 255-0184 or email sweetspotdvo@gmail.com.